Does dual-core performance and Nvidia Ion graphics make this a netbook to look for? Will more power make for a better netbook? You'd be forgiven for thinking the days of humble netbooks such as the Asus Eee PC 1215N are numbered, with tablets such as Apple's iPad, the Viewsonic Viewpad 10 and the Samsung Galaxy Tab currently stealing the limelight. While it can't be denied that sales have been hit by the new breed of ultra-stylish tablets, they're not exactly direct competitors to netbooks; you're unlikely to opt for a tablet if typing documents or carrying out other keyboard-intensive tasks is on the menu. 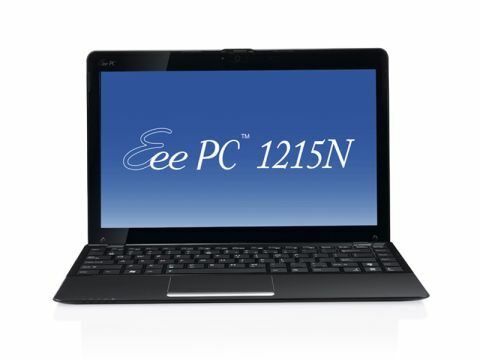 What we have here is the latest effort from netbook pioneer Asus, namely the Eee PC 1215N. With enhanced graphics and a dual-core processor, it's aimed at people looking for a mix of portability and performance. However, the Eee PC 1215N also comes with a rather heady price tag of £429, which some will say instantly prevents it from being called a netbook at all. But with its Eee PC moniker, Asus clearly sees it as a netbook. So what exactly do you get for your extra notes? Well, quite a lot, as it happens. Most obvious is the display, which is larger than what you'll find on most netbooks at 12 inches. It also looks good and feels reassuringly solid in the hands. There are none of the nasty creaks you get on cheaper models when opening the lid, for example, and its smooth, curvy design looks great. Asus has also done well to accommodate the six-cell battery into the chassis; it protrudes ever so slightly on the underside, but not enough to ruin the shape of the netbook. There's a fair bit going on under the hood, too, with a dual-core Atom processor and Nvidia's Ion graphics combining to produce above-average performance for a netbook. You'll be sorely disappointed if you're hoping it will double as a mini games machine, but it certainly outperforms its cheaper, single-core rivals such the Acer Aspire One 533. Ultimately, though, the Eee PC 1215N's success will be down to whether or not Asus has done enough to justify the rather high price tag.